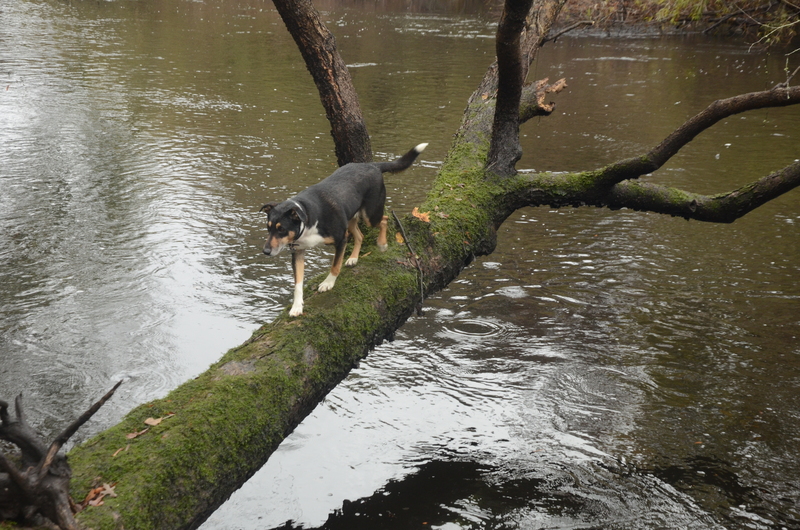 Jesse Demonbreun-Chapman and Oconee venture down a misty and rain-swollen Ogeechee. When last I set paddle in the Ogeechee River, it was August 2012, the end of a long summer of drought in south Georgia, and we were considering holding Paddle Georgia on its path the following summer. That day the river flowed at 100 cubic feet per second and the gauge at Rocky Ford read just 2 feet. Not long after launching we concluded that bringing 300-plus people on this narrow, strainer-choked river would invite mutiny. Paddle Georgia 2013 was instead held on the Flint River. Last week, I returned to the Ogeechee for a second go at scouting this blackwater beauty. Paddle Georgia 2015 is to set a course on this river June 20-26. With shuttle assistance from Ogeechee Riverkeeper Emily Markesteyn, and accompanied by Jesse Demonbreun-Chapman, Ogeechee Riverkeeper Outreach Coordinator, and my dog, Oconee, we set out in a light rain from Rocky Ford bound, we hoped, for Kings Ferry some 90 miles downstream. The light rain soon turned into a heavy rain. One of the ironies of the Ogeechee is that low water has kept Paddle Georgia away from this river, but every time I have paddled it, the rain has come down in buckets. The river ran at 3 feet, and by the following morning it would be up to about 4 feet—twice the depth of my original Ogeechee encounter. The Ogeechee as it flows through Bulloch County near Stateboro. On other rivers, a 2-foot change in water levels may not even be perceptible. On the Ogeechee, with its low banks and wide floodplain, a couple of feet equals a transformation. The river spreads into sloughs and over low banks, creating paddle paths where there were previously none. The strainers were still omnipresent, but passable (with a couple of notable exceptions). We employed “Duck and cover,” limbo” and some tricky paddling to navigate through, under and around many of the obstacles. And, the river remained as schizophrenic as ever. A wide, open paddle path suddenly devolved into multiple, braided and strainer-choked channels only to give way again to a long, wide straightaway flanked by a high bluff. And, while the landscape was predominantly wild…we encountered deer, alligators, otters, wild hogs and turkey, where the land permits, fishing camps, cabins and even upscale homes crowded the river’s banks—all built on stilts or otherwise raised above the river’s floodplain. 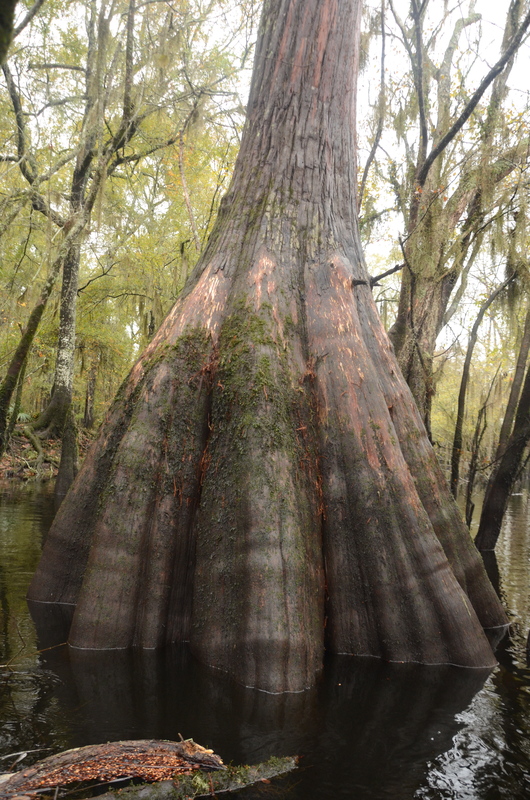 Cypress trees and knees dominate the banks of the Ogeechee. As Jesse and I paddled down river in the rain, we repeatedly heard limbs and trees crashing to the ground in the riverside forests—weak trees weakened further by the weight of the downpour. We took mental note and determined camping on the safety of a sandbar beyond the reach of aging hardwoods might be advisable. But, alas, with the river up, the few sandbars that exist along the Ogeechee were underwater and we set up a sodden camp in the cover of the floodplain forest. In the middle of the night with Jesse cocooned in his hammock and Oconee and I nestled in our tent, we heard a familiar “crack.” A split-second of terror followed, just enough time to draw my knees to my chest and cover my head with my hands. The crash that followed shook the ground. When daylight broke, we found the limb from a decades-old oak in a death sprawl between the hammock and tent—20-feet-long and weighing several hundred pounds. The business-end of the log had impaled the ground just 20 feet from Jesse’s head. Frightening as the night was, I think this is why we go on wild adventures: to be humbled by the power of nature and to be made to feel small in a vast and unknowable wilderness. In a world that so often presents the illusion that we control our destiny, this is a healthy reminder. An intrepid Oconee explores a precarious perch. 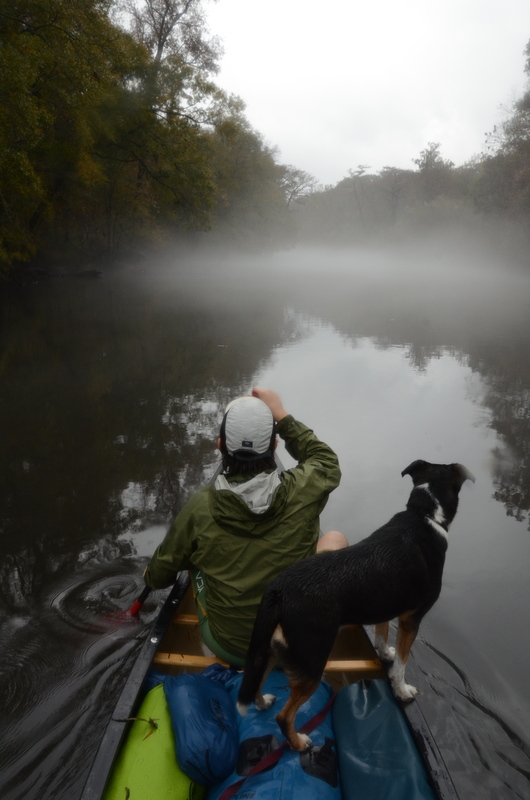 In its first 10 years, Paddle Georgia has ventured on 12 different Georgia rivers. The Ogeechee is unlike any of those. Notably, it will be the first blackwater river we’ve ventured upon. Its ever-changing channels will leave you befuddled and its primeval landscape dominated by cypress, tupelo and other water-loving trees will leave you enchanted. It is a place where our emergence from the primordial soup seems not so distant history. After two days and about 60 miles on the river, the rain chased us to dry land and Oconee and I to the Motel 6 near Richmond Hill. The next day, we explored the Ogeechee via backwoods highways and muddy dirt roads leading to river landings. The circa-1800s Knight Family cemetery near the Ogeechee River. 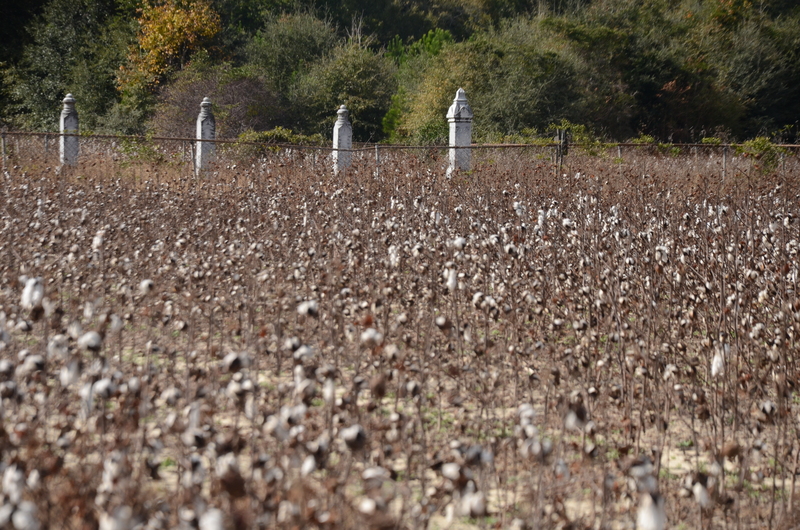 We stopped at the Ogeechee Canal—a 16-mile channel engineered in 1830 to connect with the Savannah River and a definite historic stop on next summer’s Paddle Georgia—and we stumbled upon the Knight family cemetery—circa 1800 grave markers surrounded by the vast remains of this year’s cotton crop. We returned home buoyant and excited for more adventures on the Ogeechee. It had spared our lives and given us just a taste of the stories it has to tell. 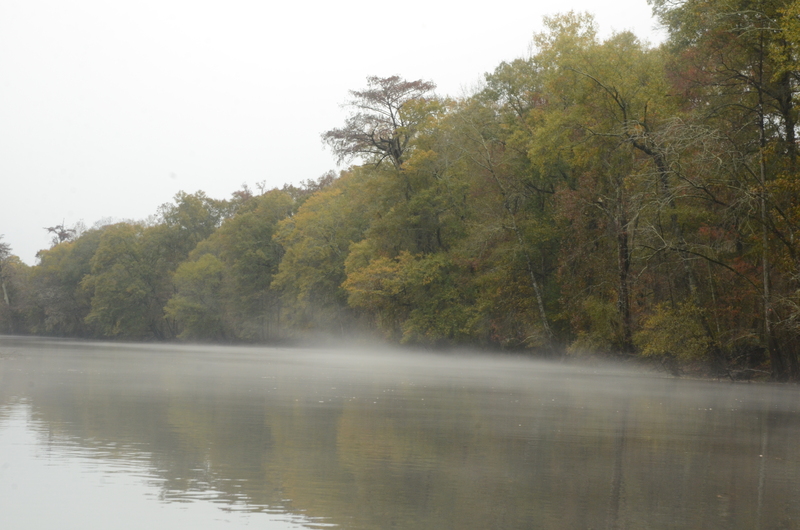 Registration for Paddle Georgia 2015 on the Ogeechee begins in later January. Keep your eyes peeled for additional information soon!